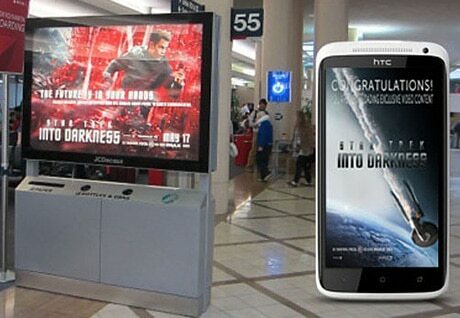 Blockbuster movie Star Trek Into Darkness is being promoted at four US airports via displays equipped with NFC marketing specialist Blue Bite’s mTag platform. Using Clear Channel Outdoor and JCDecaux displays and in partnership with mobile marketing agency Joule, consumers can access exclusive video content by tapping their NFC device to the phone-style “communicator” shown in lead character Kirk’s hand. “We are excited about the opportunities that NFC technology provides, and feel that Star Trek is a great property to take advantage of it,” says Faye Ugolnik, senior vice president of media at Paramount Pictures.